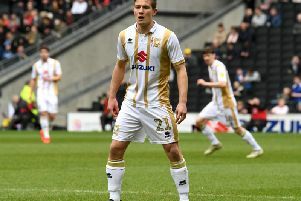 Dan Micciche has pointed the finger at MK Dons fans for revealing news of Lee Nicholls' injury ahead of the game against Doncaster Rovers on Saturday. Nicholls is likely to miss the rest of the season with a hand injury picked up in the 5-1 defeat last week at Wigan Athletic, meaning Wieger Sietsma took over between the sticks against Rovers, but Dons were beaten 2-1 at Stadium MK to leave the side four points from safety with four games remaining. News of Nicholls' injury broke late on Tuesday night ahead, and though Micciche admitted Nicholls would be an injury doubt in the press on Thursday, he pointed fingers at supporters in the aftermath of the Rovers defeat. He said: "I cannot believe stuff was put on social media three days before the game about our goalkeeping situation from so-called supporters. I think we shoot ourselves in the foot sometimes." Some fans took to Twitter after the game to criticise the Dons players for not clapping them at the full time whistle, to which Micciche added: "The supporters have to understand these players are on the floor. "Sometimes they might be on that frame of mind, but this affects them so much. You don't know how much this means to them. "I thought it was lazy journalism that I didn't bollock the players after the game the other day. You don't know what happens behind closed doors, and I'm not going to tell you everything. This means so much to the players and the staff. If the players haven't clapped, I apologise on their behalf. It's nothing against you. The players are devastated."